The historical Aduma mask that provided the inspiration for my mask is shown above. When ordering, please specify desired mask by serial number or colors. Origin: Gabon, Aduma, Latoursville. Resembles one used consistently in the Western Sudan. This mask is relatively rare in collections. 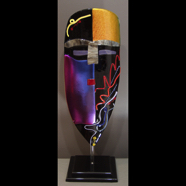 This kind of mask, called Mvoude, is used by several ethnic groups as well as the Aduma. It has been suggested that this mask was used by a now forgotten initiation society. Today it is used mainly for entertainment. An original of this mask may be seen at the Dallas Museum of Art, which has a very extensive African collection. Size approximately 13"x34" on a 10" stand. The gold on this mask is like magic. The color changes from a gold to a copper red depending on the angle you view it. The poured pieces create an array of color so it will compliment your interior color scheme. Really beautiful.This is one of my Signature Pieces.